So a while back on pinterest I pinned a way to organize my scarves with shower hooks attached to a hanger. I still think this is a genius idea and would work great. However, when I got ready to organize mine I wondered why would I need the shower rings when I can just attach the scarves right to the hanger. How do I get my scarves to hang like that? First you want to lay your scarf like the picture below. Then you want to bring the ends over the hanger and through the loop. 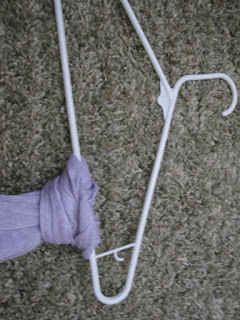 Lastly, pull tightly so that the scarf hangs nicely on the hanger. Continue with all your other scarves doing the same steps. The hangers will probably fit 5-10 scarves per hanger depending on the thickness of each one. As you can see in the first picture I color coded mine as well, just a little extra touch if you prefer that. How do you store or organize your scarves? This is such an awesome idea, I will def have to give it a try! I came across your blog from another blogger and I am so glad I did! I am your newest follower! This is a super cute idea! I have SO MANY scarves tossed all over my closet floor, so I need to be more like you. Lol. cute idea:) I’ve just now found myself with a crazy number of scarves so I think I’ll used this to organize them:) Thanks! Love this ! So simple and clever! Thanks so much for co-hosting the hop over the weekend, I hope you were able to increase traffic and find some new followers. Be sure to link up every Friday. I’ll be doing another giveaway here soon 🙂 Thanks Again! lol, I just did this tonight with my scarves I kind of clothes pined them on ( Tachy looking) I’ll try the knot look later. you are so clever. I dont really have many scarfs but the few I do have have their own personal hooks. I use to have them all in a drawer but I could never find the one I wanted without pulling half or all of them out or my daughter would go yank a bunch out too. Plus, this frees up drawer space as well.